in an effort to help maria fulfill her [mini] dream of entertaining in her dallas studio apartment, we decided to throw together a fall-themed dinner for friends. to us, fall foods consisted of pumpkin, corn, potatoes, maple pork, and apple pie. 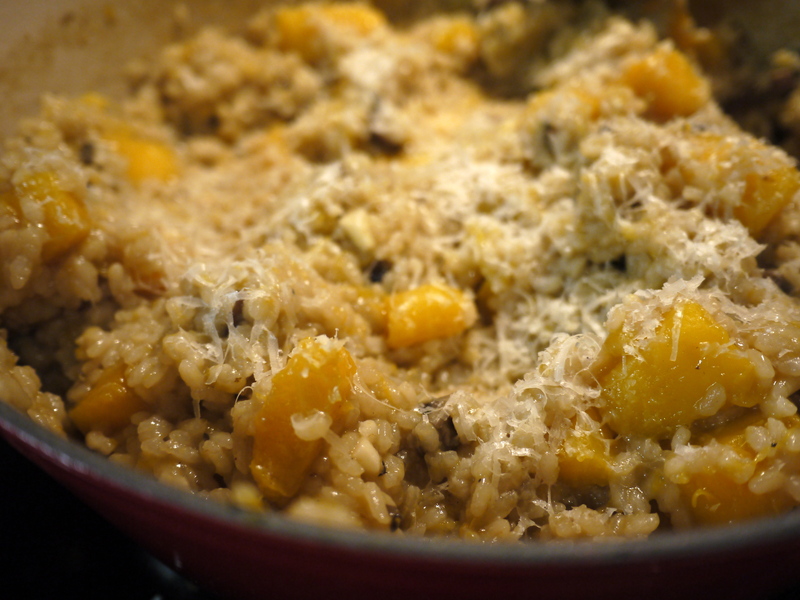 in another effort to use my le creuset as much as possible, we decided to make a pumpkin risotto. Cut the pumpkin into quarters, removing the seeds, sprinkle a little of EVOO and roast in the oven at 400 degrees for 45 minutes, or until soft. Cut off excess skin and dice into small 1/2 inch pieces. Roughly 25 minutes into the pumpkin roasting, you can start preparing the remaining part of the risotto. Saute the onions and garlic in EVOO in a dutch oven (a regular non-stick pot will work too) on medium high. Add the rice and 3 cups of broth. After the broth is boiling, reduce the heat to medium. Stir and continue adding broth 1/2 cup at a time as the rice absorbs the liquid. You can cover the pot every so often, but keep a close eye that the rice doesn’t stick to the bottom of the pot. Once the pumpkin is done roasting, add it to the pot and any remaining broth. Once the rice is tender, freshly grate parmesan cheese into the pot (as much as you like! ).